Liriope (Liriope spp. ), also known as lilyturf or monkey grass, makes for a tough, drought-tolerant ground cover. Although liriope looks quite a bit like grass, it's actually an herbaceous flowering perennial plant is the asparagus family that's often used a ground cover to prevent erosion, to serve as an edging plant, or to help with weed control. Liriope is also the genus name of the plant, as well as the common name for the broad category. In the United States, the two most commonly grown forms of liriope are Liriope spicata, which is named for the spiky form of its flowers, and Liriope muscari, named after Muscari botryoides, the botanical name for grape hyacinth, which has a similar flower formation. Whatever cultivars of L. spicata or L. muscari, you are growing, liriope is a low-maintenance plant. Both species are tough plants that can grow in sandy or clay soil, as well as in full sun or part-shade. The only "must-have" for a liriope plant is well-drained soil. Plant each liriope about 1 foot apart, keeping in mind that L. spicata will spread, as it's a creeping plant. It's not necessary to divide the plants, though you can do so every three to four years. In colder climates, winter protection with a layer of leaves or mulch may be necessary to prevent complete winter kill. Liriope plants can be grown in partial shade, although they do very well in full sun. Liriope tolerates a wide range of soils and soil conditions, except for constantly soggy or wet soils. Once established, liriope plants are fairly drought-tolerant, as long as they have well-drained soil. During the first growing season, water the plants regularly—but not every day, as that can cause soggy soil conditions. Liriope plants prefer moderately warm daytime temperatures, ranging between 68 degrees Fahrenheit to 75 degrees. If liriope is planted in very cold climates,it will likely die back in winter, (in warmer climates, it is evergreen). In cold climates, some winter protection may be necessary. Liriope doesn't need much in the way of feeding, but it can benefit from being fertilized in the early spring with a slow-release shrub and tree fertilizer or organic plant food. There's no need to propagate liriope plants because they're vigorous growers. 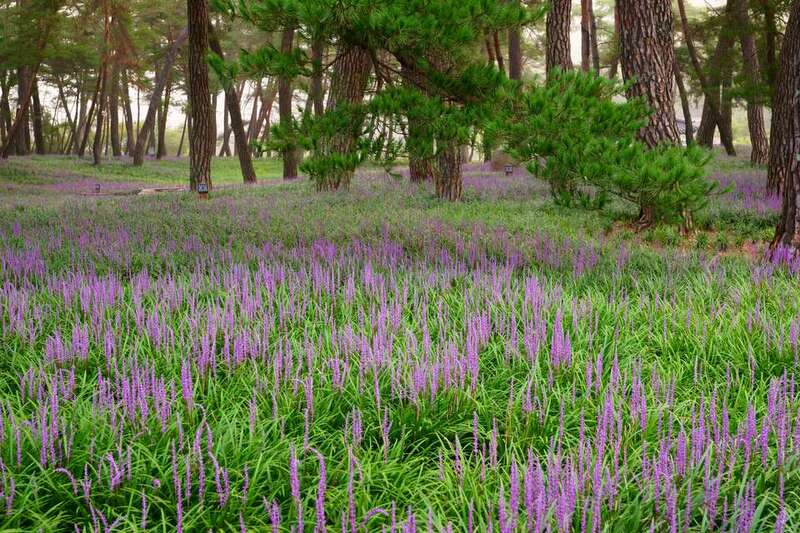 In fact, you're more likely to have to restrict the growth of liriope to one area by setting up bamboo barriers or burying landscape edgings to contain the spread. Liriope muscari: This species grows in a clump form and is well-suited for edging. The leaves are between 3/8 and 1/2 inches wide with larger flowers. Cultivars include 'Majestic,' which has large lilac flowers and dark foliage; 'Christmas Tree,' with light lavender flower spikes; and 'Evergreen Giant,' which features stiff-texture leaf blades and white flower spikes. These ornamental grass look-alikes spread via rhizomes, to the point of being considered invasive plants in some regions. Indeed, one common name for them is "creeping lilyturf"—and whenever you see "creeping" in a plant's name, that's often a red flag that it spreads aggressively. To keep the liriope looking nice and neat, mow or shear the foliage back to the ground during the late winter or early spring before new growth begins. Liriope is most often used as ground cover, but it can also be grown in pots. Grow the plant in moist, well-drained soil, such as quality potting soil or potting mix. The container should be large enough for the plant to grow for two to three years and have drainage holes at the bottom. Anthracnose: This fungal disease results in reddish-brown spots that appear along the leaf margins and leaf tips, caused by the Colletrotichum species. It's more prevalent when the plant is subject to frequent rainfall or overhead irrigation. Stop the spread by mowing or trimming off last year's leaves to a height of about 3 inches, removing as much of the debris as possible. Leaf and crown rot: Caused by Phytophtora palmivora, a fungus-like pathogen, leaf and crown rot is characterized by the yellowing of interior foliage at the start, followed by the browning of basal leaf sections. Pull and dispose of plants showing leaf and crown rot to avoid spreading the disease. Slugs and snails: These pests may feed on these plants; they can be minimized by keeping the ground free of debris, or by spreading diatomaceous earth. What Are the Best Landscaping Shrubs for Your Yard?